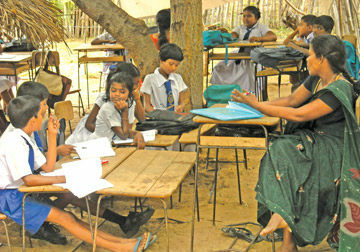 Sri Lanka Ministry of Education has decided to recruit graduate teachers to fill vacancies in National Schools that teach in the Sinhala and Tamil medium. They will be recruited to fill vacancies in classes from Grade six to eleven. Meanwhile, a skills test for the recruitment of teachers under the '3/01(A)Grade of the Teaching Service' will also be held. Applications for this examination will be accepted until the 22nd of next month (June 22). Graduates, currently serving at National Colleges of Education, Teacher Training Institutes, National Schools, and those who have been employed at the Ministry of Education and its departments under the programme begun to Provide Employment for Graduates, are eligible to apply.